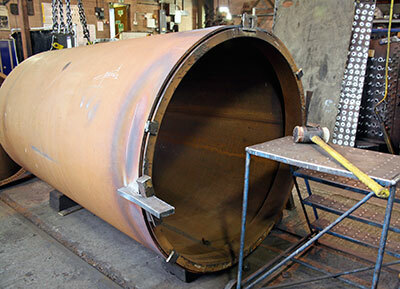 Work to reshape the ends of the tapered section of boiler barrel truly circular is in progress. A stiffening plate to fit inside this section of barrel under the dome is on order. 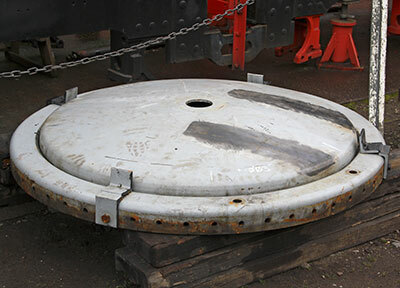 Work is also in progress on the fit of the smokebox door to the front ring of the smokebox, which has now been removed from the saddle to enable work to proceed. The cab has been removed from the chassis and rain water diverting strips welded to the roof along with convex beading around the upper doorway areas. The time draws near for de-rusting and commencement of painting. Portable machining equipment has been hired from the West Somerset Railway for light machining of the horn faces on the chassis in situ. Once these are all trued up to within acceptable tolerances work can move ahead on fitting the manganese liners and likewise on the axleboxes. A sample axlebox for the pony trucks has been cast and once checked out satisfactorily against the drawing the other three can be cast. The centre cradle casting for the rear pony truck has been received from the foundry and will be sub contracted out for machining to avoid being stuck in a queue for our own attention. Grateful thanks to the Standard 2 project at the Bluebell Railway for use of their patterns. The forthcoming issue of SVR News will contain an article and appeal leaflet, as well as a book of raffle tickets for the Guarantee Company's Slide Bars and Crossheads raffle. We were delighted to be selected for the raffle this year, and would like to thank the Guarantee Company for its continuing support for 82045. Appeals in the SVR's house magazine generally produce good results, so please keep your fingers crossed that this one will be a success. Our finances are sound and we intend to keep them that way, but some of the expenditure still to be incurred is as yet difficult to quantify, so the more financial clout we have, the better. As things stand, about 8% of SVR membership are also members of the Trust, and I would like to think that we could increase this to 10% over the life of the project. The pessimist would say this means that 90% wouldn't be supporting us, but perhaps we'd better not go there! 10% is the target figure, and we will be content if we can achieve that. If there's anyone out there who is still wondering whether to come in with us, please do join us: 82045 is widely acknowledged as one of the best of the many current new build projects, and you will be backing a winner, one that will bring huge kudos (and a lot of money) to the SVR. Bryan Clarke has asked me to thank everyone who supported the Flyer, both those who helped organise the special train and helped make the day so pleasant, and those who travelled on the train on 22nd April. He is already in the early stages of planning next year's special - watch this space! - and says he would be pleased to receive any observations from participants regarding their impressions of the day, as well as any suggestions as to how it might have been improved. His email address is bryanclarke44@hotmail.com or you can contact him via Chris. 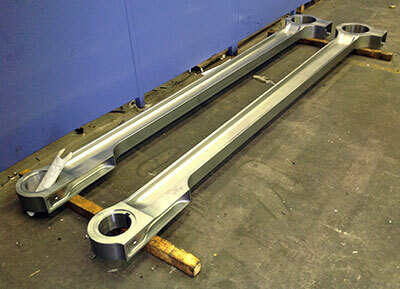 Connecting rods nearly finished. Photo: Robert Stephenson. Smokebox door trial fitting on to the front ring of the smokebox. Photo: Tony Massau. Inner liner for smokebox door and petticoat for base of chimney. Photo: Tony Massau. 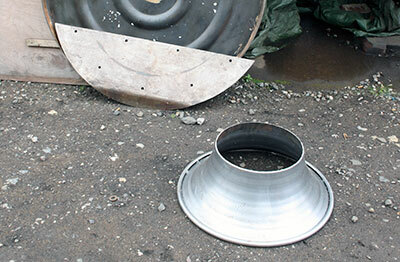 Work started on shaping the large end of the taper boiler barrel truly circular, photo mine. Photo: Tony Massau.